Completely by accident, we visited all of the major scenic viewpoints in Death Valley in order of worst to best. Although, I don’t think any qualify as worst, as every scenic viewpoint we stopped at was absolutely breathtaking and had it’s own winning qualities. First, we visited Father Crowley Vista at around 4,500 feet elevation. The parking area overlooks Rainbow Canyon and the gravel road to the lookout overlooks the northern end of Death Valley. Second, we visited Aguereberry Point at 6,433 feet elevation. Sitting opposite Dante’s View across the valley, the point is 1,000 feet taller than the more famous viewpoint. This was our first majestic glimpse of the Badwater Basin, and the experience was incredible because we were the only people at the lookout and it was devoid of all noise. Third, we climbed 1,500 feet to the top of the Keane Wonder Mine for views up and down Death Valley. Fourth, we visited Zabriskie Point at 710 feet elevation. The view was stunning and the sunset was remarkable, but because this is one of the most visited scenic overlooks in the park, the crowds were abundant and loud. Finally, we visited Dante’s View at 5,475 feet elevation. We walked out the trail to the point for a spectacular 360 degree view of the Badwater Basin salt flats, the Death Valley floor, and the surrounding mountain ranges. This was also the only place in the park we had LTE service! View of the Badwater Basin Salt Flats in Death Valley from Dante’s View Scenic Vista Point. 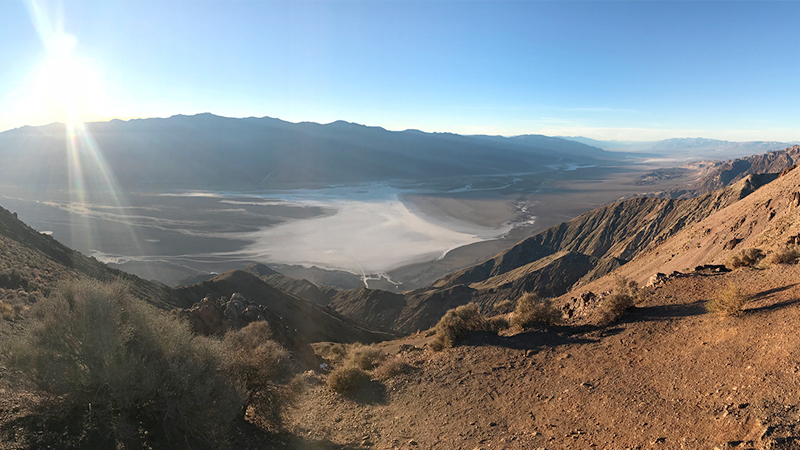 To the west, you can see the Panamint Mountains towering over the Badwater Basin salt flats (the lowest point in North America), Devil’s Golf Course, and the Sierra Nevadas. To the north, you can see Furnance Creek with the Funeral Mountains behind it. To the east, you can see the Greenwater Range. To the south, you can see the Owlshead Mountains. Basically, from Dante’s View, you’ll be able to see almost the entire 160 mile long Death Valley, and on very clear days, you can see both the highest and lowest points in the contiguous 48 states of the United States: Mount Whitney at 14,505 feet elevation and Badwater Basin at -282 feet elevation. The temperature at Dante’s View is usually 15-25 degrees cooler than the valley floor. The first time we visited the scenic viewpoint, it was late afternoon, cloudy and overcast, and with the wind blowing, we needed sweatshirts and fleece jackets because it was cold! From the parking area, there two narrow dirt trails that lead over rocky outcroppings. One leads out to a rocky point and the absolute best spot to see the entire Death Valley, mostly unobstructed. The other leads to another scenic viewpoint and picnic tables. It can be a little strenuous when hiking uphill at this elevation, and the rocky ground isn’t completely firm, but if you go slow, you’ll have no problem. We hiked out to the end and because there were only a few other people there, it was quiet, really quiet. No noise at all. Apparently this is one of the most silent places in the state. In April 1926, some businessmen of the Pacific Coast Borax Company were trying to pick the best view of Death Valley. They had nearly chosen Chloride Cliff in the Funeral Mountains when the Deputy Sheriff of Greenwater, Charlie Brown, carried them from this peak a little distance to the Black Mountains. After taking in the view, the group was immediately persuaded and promptly called this point Dante’s View. Dante’s View is named from Dante Alighieri, who wrote the Divina Commedia (Divine Comedy), in which there are described the nine circles of Hell, the seven terraces of Purgatory and the nine spheres of Paradise. To save battery life, I always keep my phone in airplane mode when hiking and there is no signal anyway, but Brian only does it sometimes, and thank goodness! While hiking on the Dante’s View trail, snapping photos of the view, he noticed that there is a strong LTE signal at Dante’s View! Hooray! Our hotel, the Ranch At Death Valley claims to have WiFi, but it was broken when we arrived, and so weak the rest of the time, that we barely could use our devices. So after being in Death Valley for four days with almost no service, this was a welcome surprise and we took some extra time here just to check and respond to email, receive/send text messages, and share photos of our adventures on Instagram and Facebook. We enjoyed Dante’s View (and the LTE signal) so much that we drove up to the scenic viewpoint again the next day to watch the sunset! Dante’s View is located 40 minutes from Furnace Creek at the end of the paved Furnace Creek Wash Road off CA-190 in Death Valley, California 92328. There is a vehicle length limit of 25 feet because the turns in the road are so tight and the parking area is small. There are no bathrooms at the viewpoint, but there is a vault toilet in a turnout along the roadside about a quarter mile before you reach the viewpoint. While visiting Dante’s View, take a moment to stop what you’re doing and just be quiet. This is one of the most silent places in the state of California and experiencing it is pretty awesome. This is the only place in Death Valley National Park that we were able to get an LTE signal. If you have trouble picking up the signal, turn your phone off, turn it back on again, and walk out onto the trail a bit. Once it grabs the signal, you’ll have it in the parking area too. The viewpoint is open 24 hours a day, year-round, and is a popular destination for stargazers. Just remember to bring warm layers if visiting at night.